According to the Hindu calendar, Kajari Teej is celebrated on the third day of Krishna Paksha (dark fortnight) of the Hindu month of Bhadrapada. Kajari Teej is also known by the names like Kajli Teej and Badi Teej. 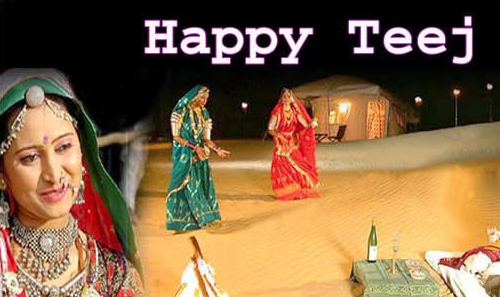 Among all other Teej days, the occasion of Kajari Teej is considered the most important for women. The Kajari Teej is more famous in Central India covering Madhya Pardesh and Uttar Pardesh. No doubt, the Kajari of Mirzapur and Varanasi (Benaras) is part of folk heritage of India. In central India, Kajari Teej is associated with Kajari Songs and Swings. Both the swing and the Kajari songs are so much identified each other that during Janamashtami, even God Krishna in his Child incarnation, is shown on swing accompanied by Kajari songs. Kajali was the name of a dense forest located in Central India and the region around the forest was ruled by King Dadurai. The people of his kingdom used to sing songs known by the same name (Kajali) in praise of the magnificent place. When King Dadurai died, his wife, Queen Nagamati, performed Sati Sahagamanam, also called Sati Sahamaranam. Overwhelmed by the incident, the people of Kajali improvised Raga Kajari. Since then, Kajari songs became popular as the songs of separation. The Kajari songs are mainly built around God Krishna. The Teej however, is based upon the mythological story of Shiva Purana and the union of Paravati and Shiva after a long separation. 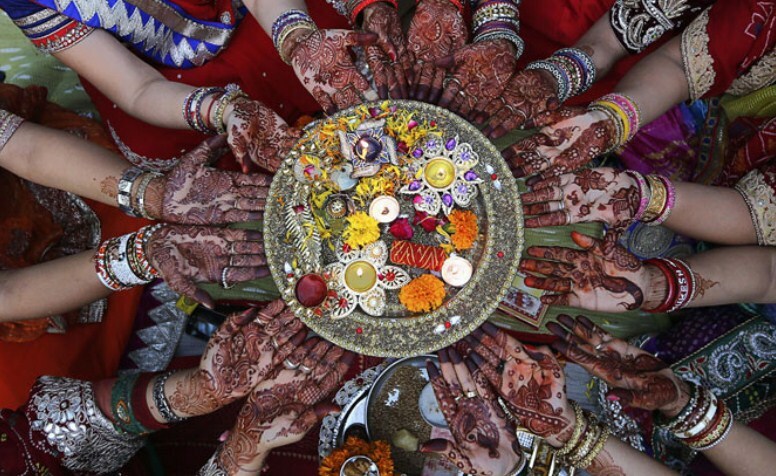 Badi Teej is also associated with the devotion and dedication of a woman towards her husband. Goddess Parvati wanted to marry Lord Shiva, but he was in grief of separation from Sati. He went to the caves and involved into deep meditation. While, Goddess Parvati wanted Lord Shiva as her husband and for this, she prayed with full dedication and devotion for a long span of 108 years. Lord Shiva became happy with her devotion and accepted her as his wife. This divine union between Lord Shiva and Parvati Devi took place during Krishna Paksha of Bhadrapada month. This day, later, came to be known as Kajari Teej. Therefore, it is said to be very auspicious to worship Goddess Parvati on the day of Badi Teej or Kajali Teej. The festival of Kajari Teej holds an immense importance for women. It is said that keeping the fast on this day gives longevity to their husband’s life. The married and unmarried women keep fast on this day and worship Goddess Parvati and Lord Shiva to seek their blessings. On the occasion of Kajri Teej, married women visit their parents’ place. The Nirjala Vrat is observed on the occasion of Kajari Teej by the females for longevity of husband’s life. The newlyweds especially visit their home, as it is considered to be the first Teej celebrations for them. Other than Bundi in Rajasthan, Kajari Teej is also celebrated in other parts of North and Central India with great excitement and joy. 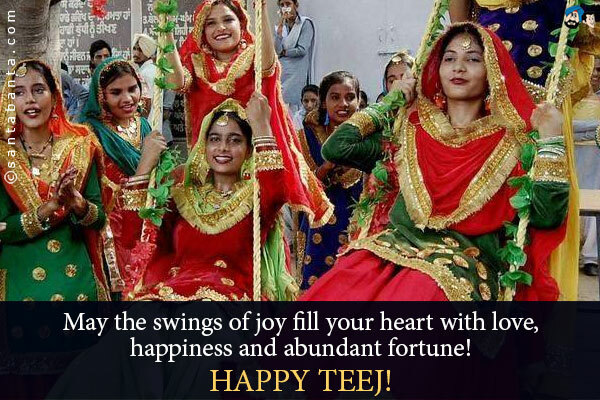 Women in the states of Madhya Pradesh and Uttar Pradesh (particularly in Varanasi and Mirzapur) celebrate kajli Teej with enthusiasm. 2. Another legend states the story of Lord Shiva and Mata Parvati that is mentioned in the pages of Hindu mythology. It is said that Parvati observed strict penance for 108 years in order to get Lord Shiva as her husband. In the end her wish was fulfilled on the day of Bhadrapada Krishna Paksha Tritiya. The unity of Lord Shiva and Maa Parvati is thus signified by the occasion of Kajari Teej. 1. Mata is worshipped on this day as women seek blessings for the improvement of their husband’s lives. 2. All women observe a special Kajari Vrat on the day of Kajari Teej; whether they are married or unmarried. 3. Many women sing songs, dance and participate in several festivities. 4. There are ceremonial swing ceremony where married women swing from elaborately decorated swings.